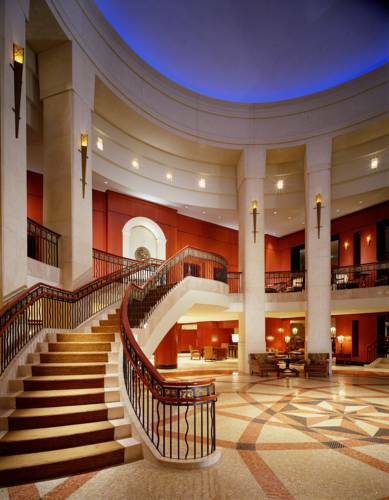 Embracing its historic origins, the InterContinental Chicago hotel has an airy lobby with a sweeping staircase and marble mosaic floors, alongside ornate period ballrooms that are ideal for parties and events. You can enjoy breathtaking views from the 32nd-floor Tower Lounge, and wind down with a sauna, a massage or a swim in our classic 1920s pool. Flawless service and gourmet cuisine typify Michael Jordan's Steak House & Bar, and you can savor fine wines by the fire in our stylish ENO bar. King Arthur Court: Inside the King Arthur Court, a series of colorful paintings depict the life of King Arthur, as well as scenes of later Christian events and daily life in Gothic times. Elaborately carved wooden beams line the walls, providing a masculine feel. Fashion Outlets of ChicagoConveniently located minutes from the heart of downtown Chicago and O Hare International Airport, near several major hotels and attractions, Fashion Outlets of Chicago is the newest must-shop destination when visiting the Chicago area. Lego StoreCheck out the latest giant Lego creation at this fun venue that nurtures the kid in all of us. Hidden away on the third floor of the Westfield Mall located on Michigan Ave. right across the street from the hotel.